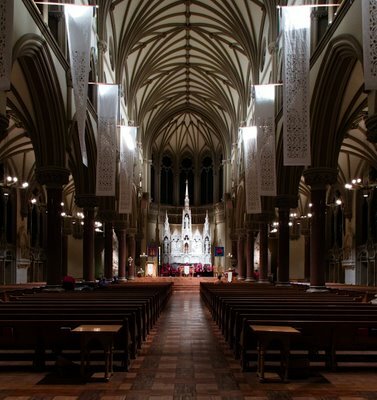 Here are photos of Saint Francis Xavier Church, on the campus of Saint Louis University. 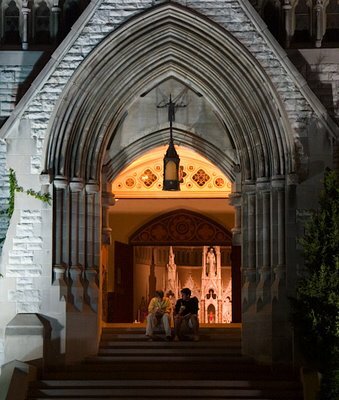 Sometimes known as College Church, this parish is staffed by Jesuits and Redemptorists. Click on any photo for a larger version. 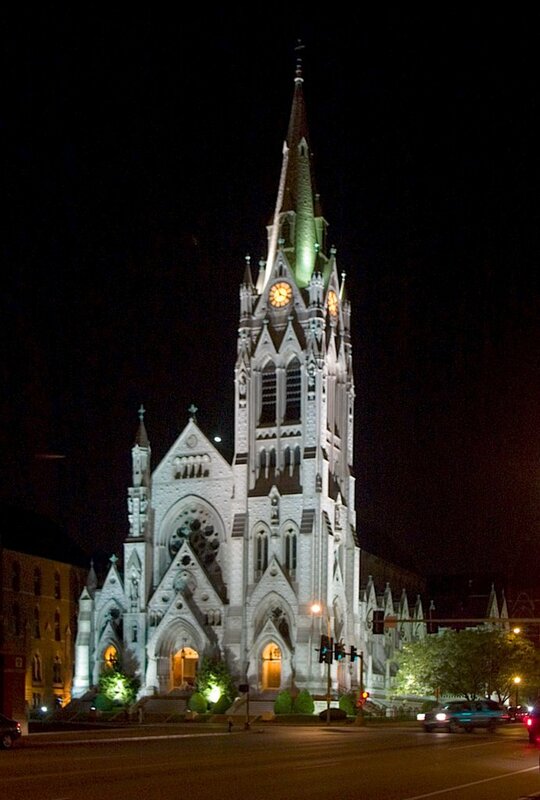 This Gothic Revival church is based on a 19th century Cathedral in Ireland. 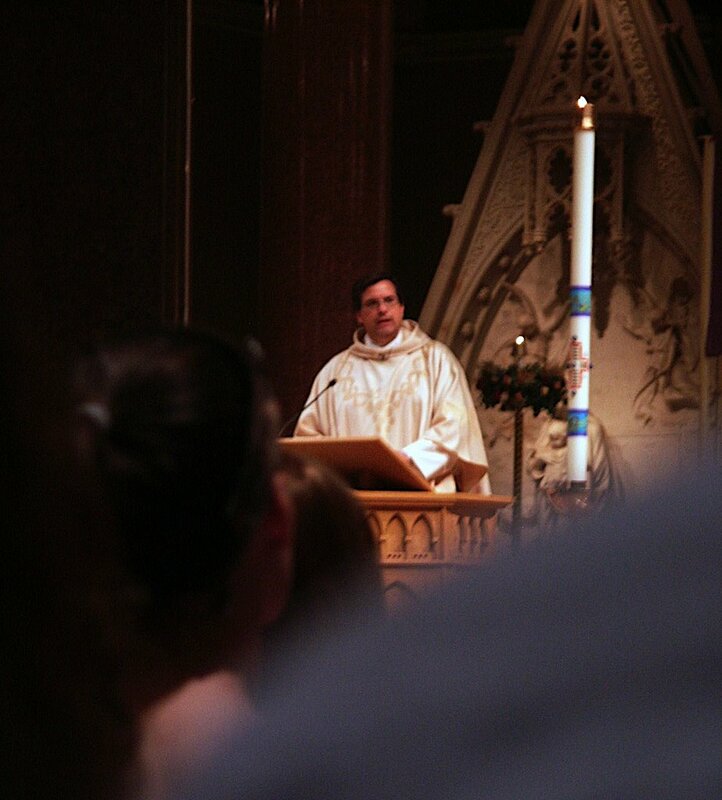 During the school year, the church offers a well-attended 10 p.m. Sunday Mass. 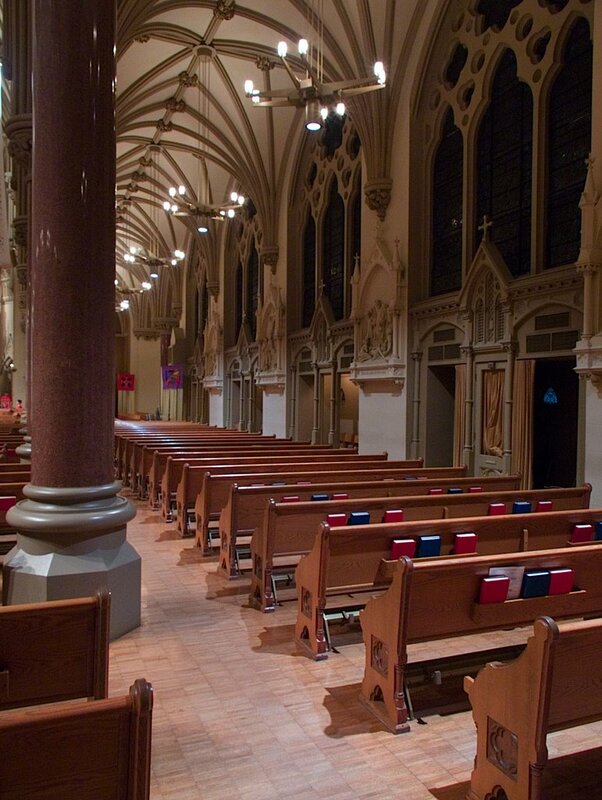 The interior had been renovated in the 1980s according to the suggestions in the document "Environment and Art in Catholic Worship" published in 1978 by the United States Conference of Catholic Bishops. Fortunately, much nice architecture remains in the church and is photoworthy. 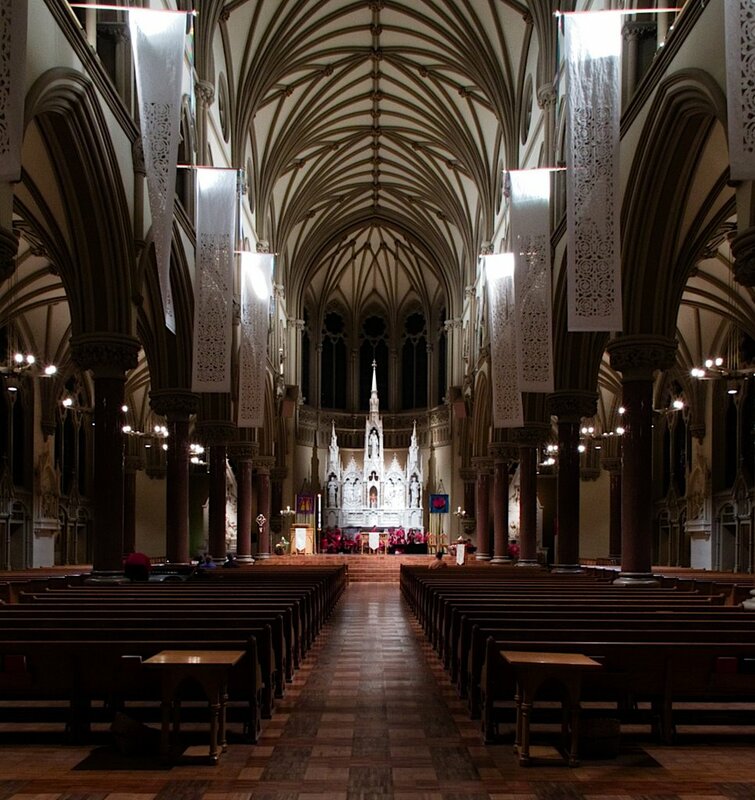 Like many churches based on this model, the form of worship here tends to be congregational and iconoclastic. Likewise, the Mass is seen more as a communal meal and less a sacrifice. 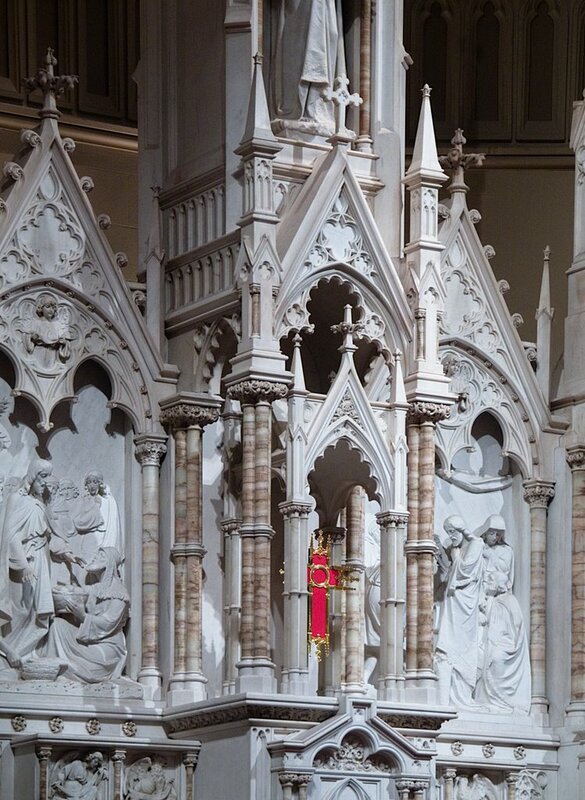 The Mass itself shows the influence Evangelical Protestantism has had on the Church in recent decades. However, I was greatly moved by the hymn "Holy God We Praise Thy Name", beautifully sung by the choir; this traditional hymn was quite different than the modern music sung during the rest of the mass. 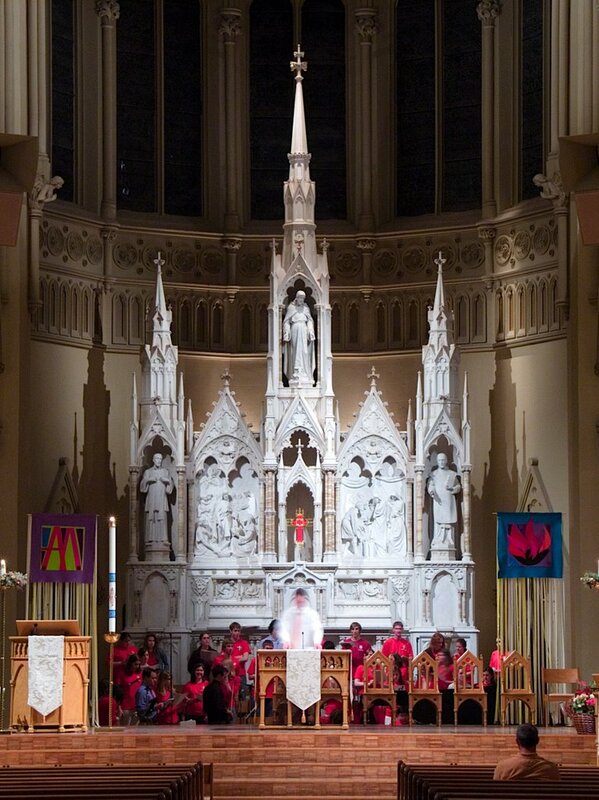 The high altar was retained by the renovation; the choir and musicians now are situated in the former sanctuary. A detail of the altar. One of the numerous side-altars in the church. 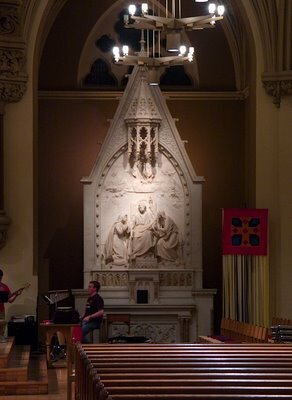 The tabernacle, located in the right transept. A side-aisle, lined with confessionals. 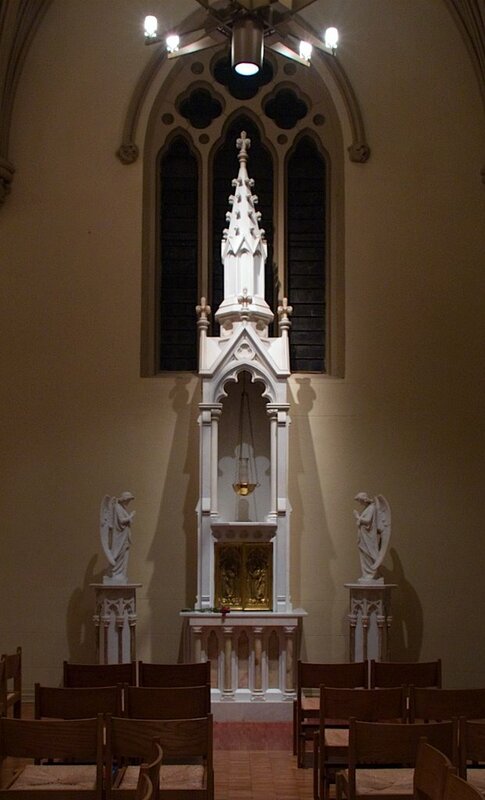 The sacrament was offered here before Mass. A little window inside a former confessional. 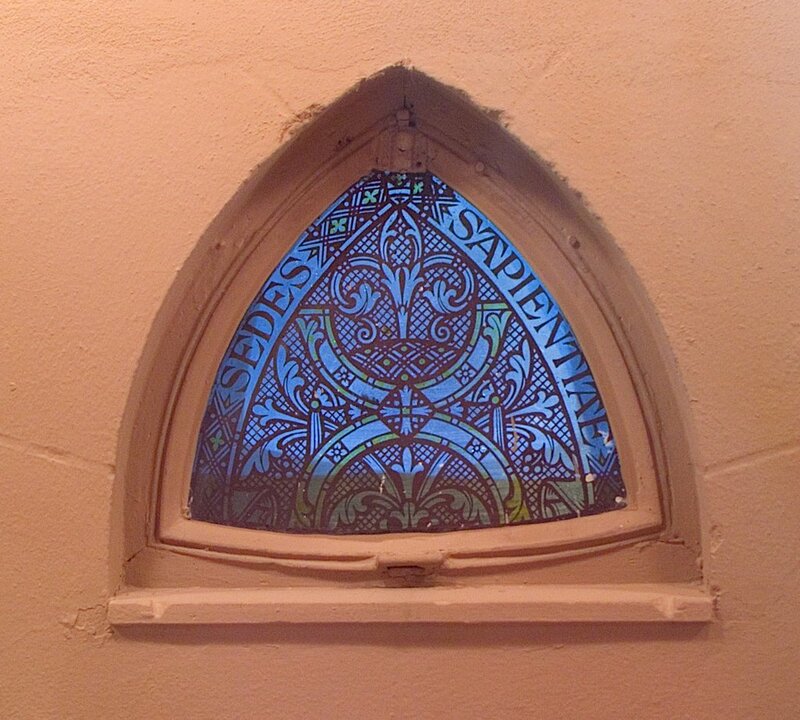 The Latin reads "seat of wisdom", a title of Mary: Christ, the logos, is Wisdom. The side of the nave, showing the verticality of this church, and wonderful Gothic arches. 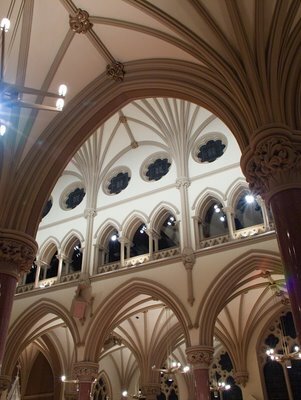 Another view of the arches. 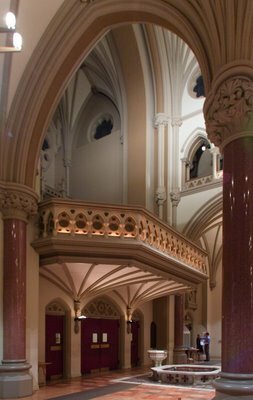 The choir loft. Note the baptismal pool near the entrance, made during the renovation. 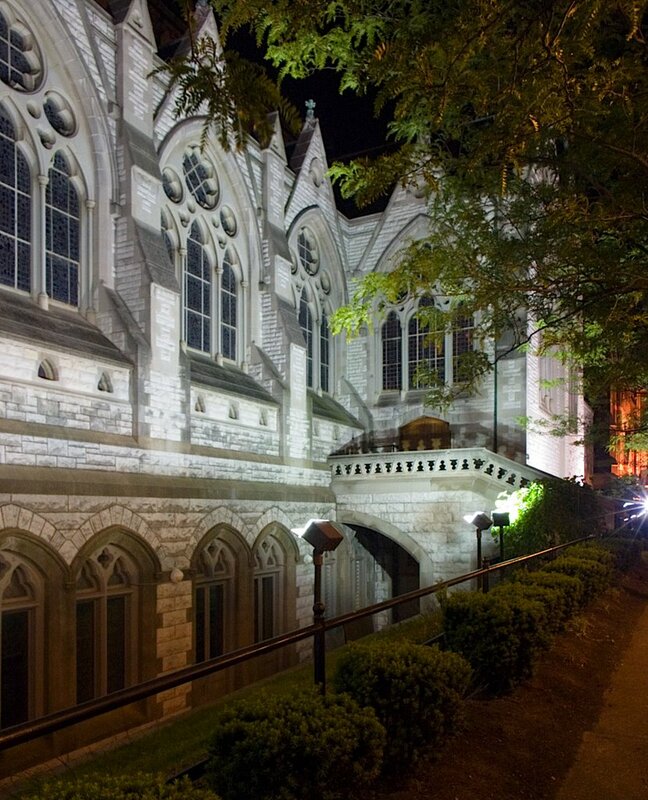 The side of this cathedral-sized church. Students at the main door are enjoying Ted Drewe's frozen custard; the church offered this treat in honor of it being the last 10 p.m. Mass of this school year. 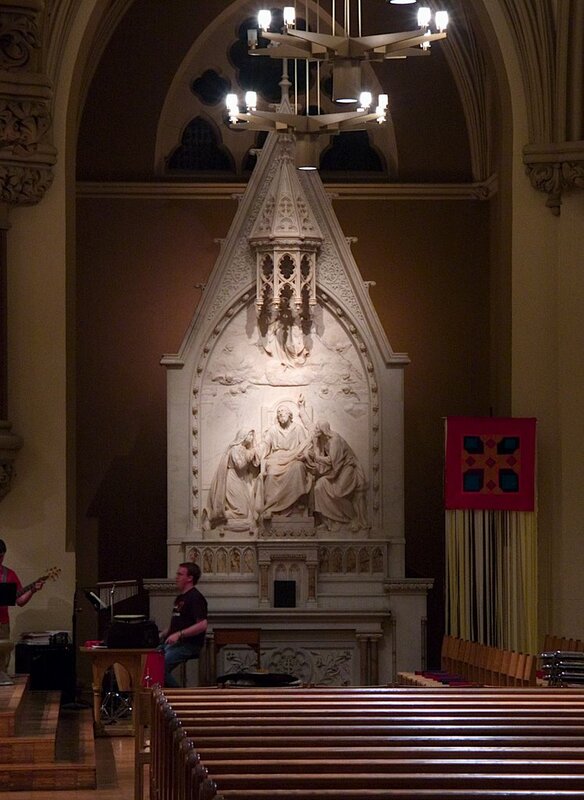 The renovation left the reredos, but chopped the mensa off the old high altar. 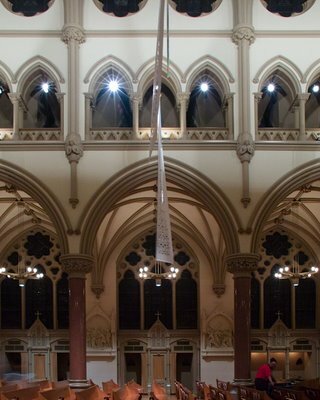 "Religious Liberals Gain New Visibility"
"In Saudi Arabia, a Resurgence of Sufism"
"Eminent domain bill passes state Senate"
"Justice Scalia attends Mass in St. Louis"
"For Science's Gatekeepers, a Credibility Gap"